We spent the end of February digging into art journaling. Well, I have another amazing resource for you that I believe is worth checking out!! Today I want to introduce you to Brené Brown, PhD. She is the author of not one, but two #1 New York Times Bestsellers: Daring Greatly: How the Courage to Be Vulnerable Transforms the Way We Live, Love, Parent, and Lead (2012) and The Gifts of Imperfection (2010). Her TED Talk on vulnerability is one of the most watched of the TED Talks. If you’ve ever thought, “What will people think?” or “I am not good enough,” The Gifts of Imperfection eCourse will take you on a joyful, courage-building journey unlike any other. 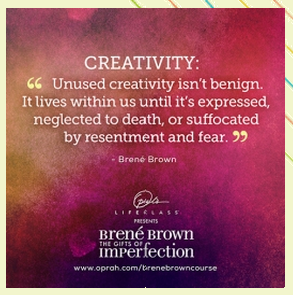 Roll up your sleeves, DIG deep and get messy with Brené Brown. In a one-of-a-kind art-journaling eCourse, Brené will take you through her Guideposts for Wholehearted Living—and leave you feeling more connected and passionate about life. You can find out all about the eCourse here. Watch the video —Brené herself explains everything! !